A small, Victorian copper, oval omelette pan. This piece is English and it dates from c.1860. 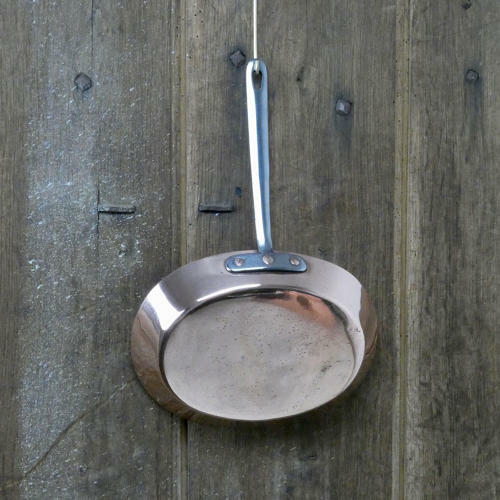 The steel handle is the typical English form and the pan is made from quite a substantial gauge of copper. Omelette pans were always lighter in weight than a saute pan. There is sight pitting to the copper on the base of the pan, from use, but other than that the piece is in very good condition. The interior has been re-tinned so that it can be used. The pan itself measures 22.5 long by 17cm. wide by 3.3cm. deep. The other sizes given are the overall dimensions.